Germany's ZF Friedrichshafen AG and Continental AG play key roles in Mercedes-Benz's first hybrid passenger car, the S400 BlueHYBRID. ZF units ZF Sachs and ZF Powertrain and Suspension Components produce the car's hybrid drive modules at a new assembly hall in Schweinfurt, Germany. The hybrid S class is the first car to be served by the plant, but ZF says that the site is scheduled to take on eight similar projects for four different automakers. The supplier expects the facility, which employs 50 people, to have a maximum annual production capacity of 200,000 drive units. 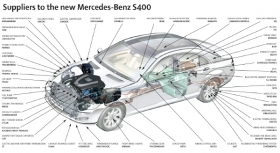 The S class hybrid's electric motor is sourced from ZF Sachs, a division of ZF Friedrichshafen. Continental supplies the car's lithium-ion battery from its plant in Nuremberg, Germany. Conti also provides that battery housing and connections. The battery stores energy recouped from the braking system. A limitation of such batteries is that they are only able to store energy efficiently between 10 and 40 degrees Celsius, necessitating a cooling system. To meet these demands, Germany's Behr GmbH & Co. KG developed a special cooling system as part of its heating-ventilation and air conditioning (HVAC) unit. The system uses a cooled disk that is placed in contact with the battery and consequently prevents it from overheating. The S400's electronic components are further protected from high temperatures by Dana Corp.'s engine seals and its thermal-acoustical protective shielding (TAPS). Dana provides those components from its plant in Neu-Ulm, Germany. The S400 hybrid is based on the S350, but has a substantially modified drivetrain, possessing a modified 279hp V-6 3.5-liter gasoline engine mated with 20hp electric motor. During braking, the hybrid motor generates electric energy that is then stored and used when required, typically to assist the combustion engine during acceleration. The stored energy also is used to regulate the vehicle's stop-start function. This device turns off the engine when the car is at a standstill and quickly restarts the engine when needed. This reduces fuel use and CO2 emissions and helps the car achieve fuel consumption of 7.9 liters per 100km. Mercedes produces the S400 Hybrid, alongside other S-class models, at its factory in the Stuttgart suburb of Sindelfingen. The car launched in Europe this summer. Its staring price in Germany is 84,323 euros with tax. The base price for the S class is 73,000 euros.